So now, dear friends, is when I admit that I am, was, and will continue to be, a complete geek. It’s interesting saying that in this space. I have posted about geeky things in the past, but my writing has been more literary-inclined of late. I circle around several themes though (long-time readers know this) and they all eventually show up here again. Oh well, it keeps life interesting at least, right? The Missoula Sci-Fi/Fantasy convention (affectionately known as Miscon) is a regular Memorial Day weekend event for us. I actually dressed in costume this year, which is a big deal for me! 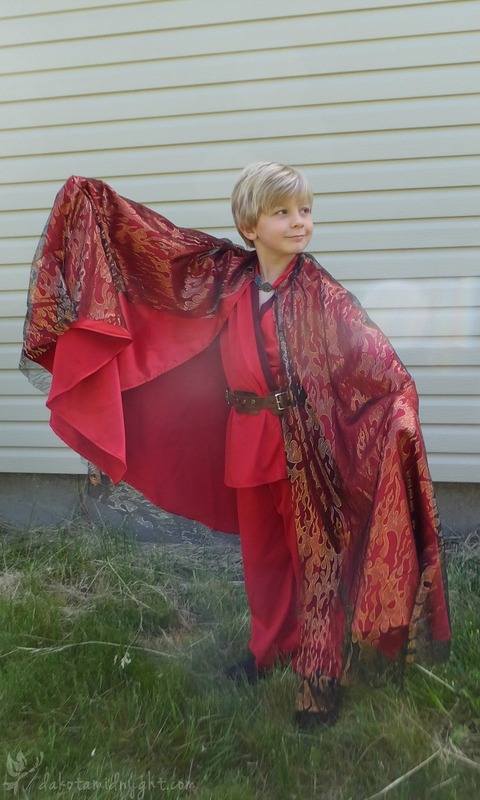 I constantly create costumes for my kids (like these Star Wars and Game of Thrones outfits) and occasionally a few good friends, but I rarely sew for myself – much less a full costume! Anyway, a friend and I have been planning a joint Link and Zelda cosplay for quite a while. (There’s a ton of Link and Zelda pictures out there, but this is one of the reference pictures we were using.) I’ve been waiting for my friend to get his chainmail done (a significant undertaking!) before I start working on Zelda’s outfit. But in the meantime we decided to switch it up and do a 50s themed Link and Zelda. I don’t care for 20s, 30s & 40s fashions. But I figured 50s was still within the realm of possibility for this year’s theme, and it still worked with the accessories my friend wanted to use for his costume, so we went with it. I spent a ridiculous number hours scrolling through Pinterest to decide what would work for this particular Zelda incarnation. Eventually I settled on McCall’s version of the 50s Butterick “Walkaway” dress after stumbling on an altered version on Edelweiss Patterns. 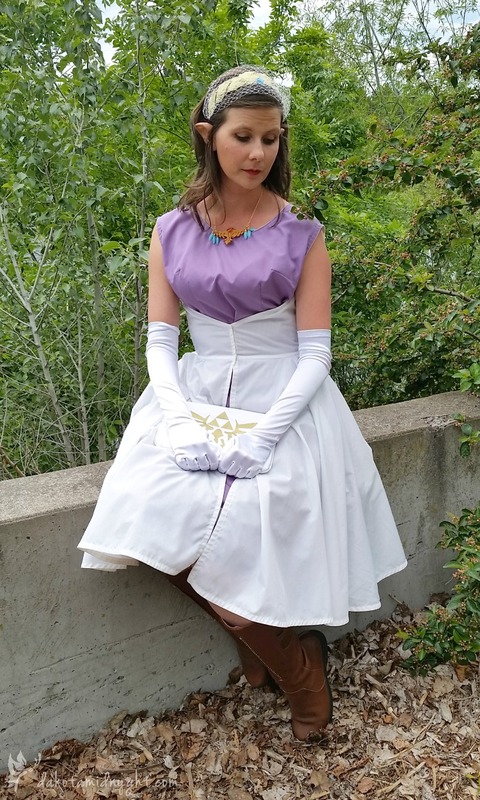 I liked that I could easily make the dress two-toned and felt that the angled “vee” of the bodice echoed the one on Zelda’s dress (albeit reversed) in a 50s fashion. It was really interesting to fit this dress. I only have so many hands, so the darts in the back were particularly interesting! I also lost weight between starting and finishing, so the end product was slightly loose. That wasn’t necessarily a negative though. Standing in a sewing room and not moving versus moving around in a convention space all day are two completely different things, and the extra room turned out to be welcome. I also looked at quite a bit of 50s era jewelry, and was delighted to find that most daytime jewelry was gold and was actually pretty substantial – although certainly bigger and more eye catching than anything I wear on a day to day basis! To bring Zelda’s jewelry into the 50s age, I shrunk her pauldron chain ornament into a necklace. I used gold sculpey to craft the pendant, rhinestones for the red jewels, and some awesome beads that mimicked the blue gems. But my favorite item – and really the thing that cinched my identity – was my clutch. 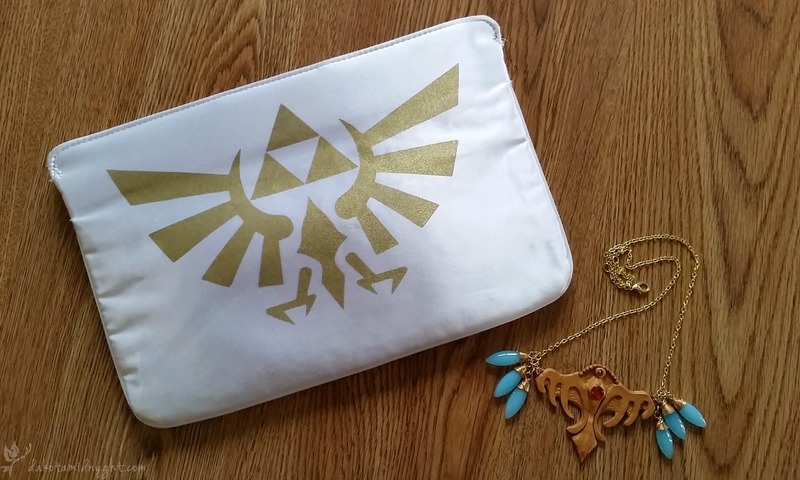 I found it at a theater rummage sale, and we added the Hylian crest with spraypaint. Yes – spraypaint. I’m still amazed by how well it turned out! 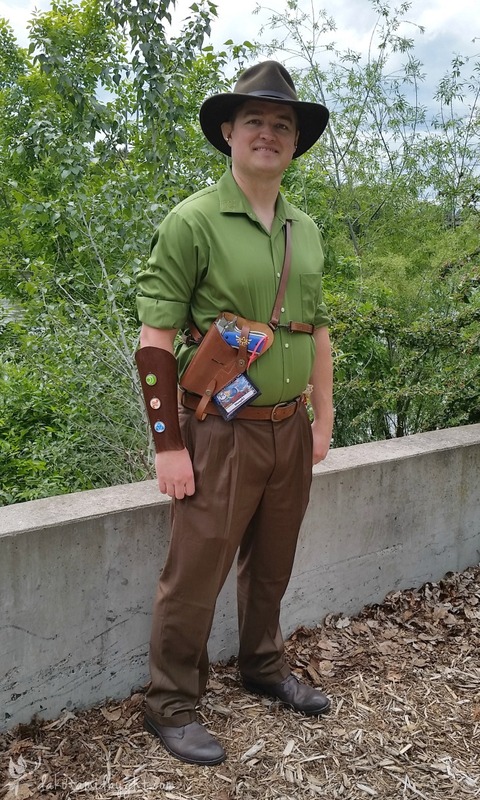 My friend’s Detective Link costume also turned out pretty well, I think. 🙂 We spent hours searching for an appropriate green shirt and coordinating hat in Missoula – but we found them! I embroidered the Triforce symbols on his collar and recreated the Goddess symbols in Illustrator for the medallions on his vambrace, but other than that, I really had very little to do with the costume. He created the vambrace, put together the medallions, and painted the grips of his (fake) gun with the blue and Hylian crest. Elf got a day-glo yellow cape – for easy tracking in crowds! 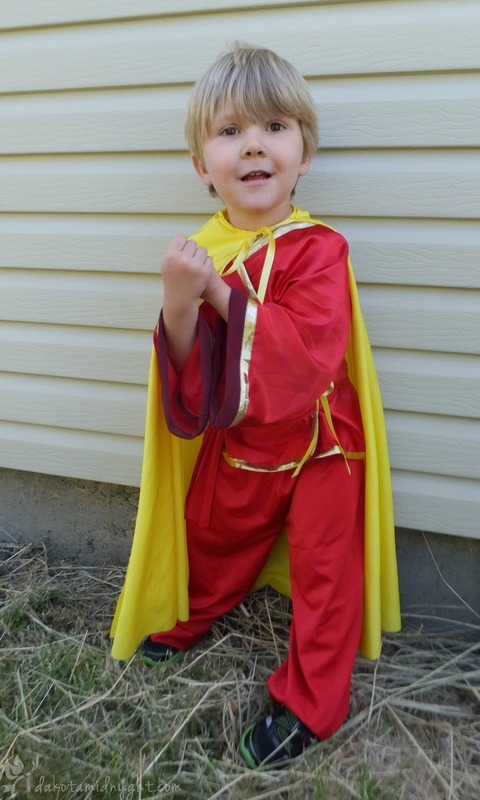 A simple gi and elastic pants are my go-to for a lot of the kids’ costumes now, so both boys got “Avatar/Fire Nation” inspired gi/pants combinations. They must have been comfortable enough – Munchkin wore his all weekend long! Love love love love!!!!! Some more love!!!!! I have been admiring your dress for days now! And the necklace is so pretty and made with sculpey too. Pride and prejudice I say! And I know the lovely coat!! You ‘d be the best lizzy ever!!!! Thank you so much Nina!!! They were so much fun to do.